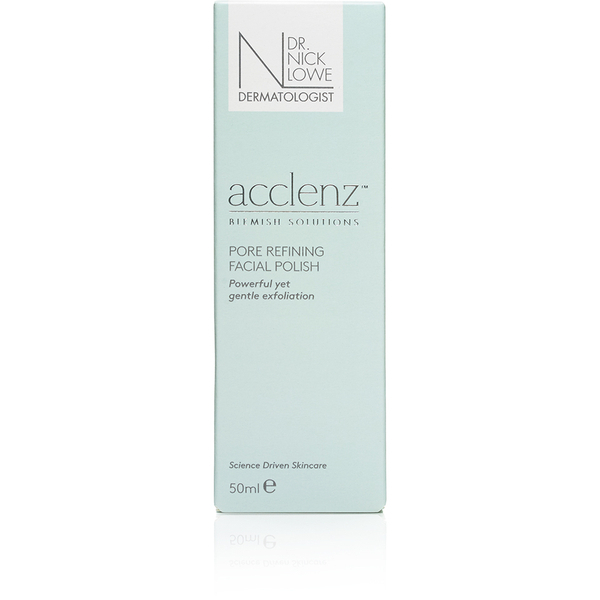 Achieve a smoother, clearer complexion with the acclenz™ Pore Refining Facial Polish from Dr. Nick Lowe, internationally recognised as one of the world's leading experts in dermatology and skincare. Catering specifically for blemish-prone skin, the polish is infused with environmentally friendly exfoliating beads that work to buff away dead skin cells and eliminate spot-causing bacteria, leaving your complexion refreshed and renewed with a radiant glow. A blend of Glycerin and Time Release Salicylic Acid deliver optimum hydration levels, whilst Eucalyptus Leaf Extract acts as an anti-microbial agent to inhibit bacteria growth. Skin is soft, purified and ready to receive other treatment products. Gently massage onto moist cleansed skin, taking care to avoid the eye area. Rinse well with warm water and pat dry. Use twice weekly for maximum effect. Aqua (Water), Polylactic Acid, Stearic Acid, Caprylic/Capric Triglyceride, Glycerin, Cetyl Alcohol, Glyceryl Stearate, PEG-100 Stearate, Coco-Glucoside, Parfum (Fragrance), Phenoxyethanol, Hydrolyzed Corn Starch, Salicylic Acid, Jojoba Esters, Cocamidopropyl Dimethylamine, Chlorhexidine Digluconate, Sodium Hydroxide, Acrylates/C10-30 Alkyl Acrylate Crosspolymer, Benzoic Acid, Eucalyptus Globulus Leaf Extract, Dehydroacetic Acid, Lycium Barbarum Fruit Extract, Hydrated Silica, Polyquaternium-67, Ethylhexylglycerin, Potassium Sorbate, Sodium Benzoate, Sorbic Acid.